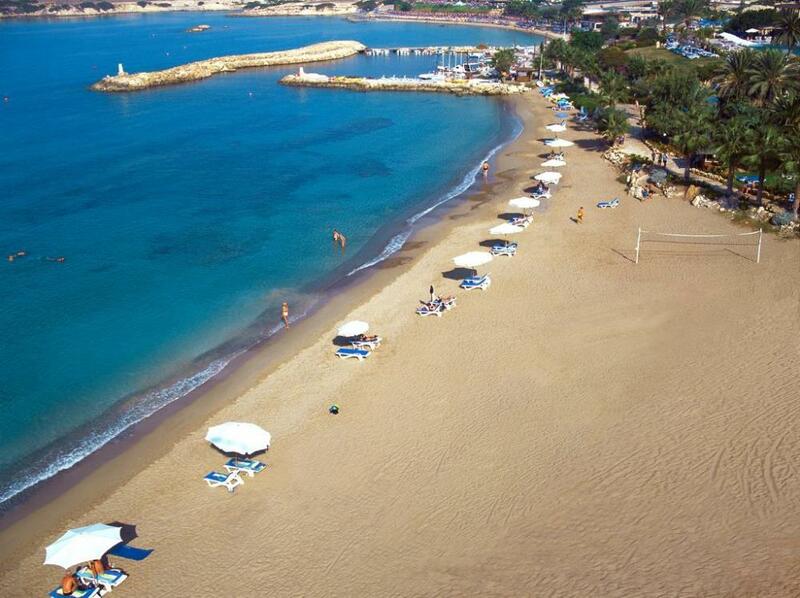 The Coral Beach Hotel & Resort is situated on 500 metres of natural sandy beach with its own private harbour and boat. It is close to the town of Paphos, 40 minutes from Paphos International Airport and 150km from Larnaca International Airport. 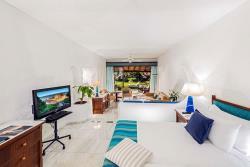 This unique resort combines the traditional Cypriot décor of white walls and authentic woodwork with the modern amenities expected of a five star resort. Guests can revitalise their body and mind in the calming environment of the Health and Beauty Spa or meander into the Arts and Crafts Centre and try traditional crafts such as basket-making, pottery-making, glass-painting, the art of mosaics and much more. Coral Blue, the Executive Wing of the resort offers guests that extra touch, with its own private entrance, lounge, breakfast area and a Butler service on request! Guests may use the Executive Lounge for tea or coffee, pre dinner drinks, computer and library facilties. Coral Blue is pleased to welcome guests of 13 years and above only. Coral Gold All Inclusive: Coral Beach Hotel & Resort pioneered the distinctive “Coral Gold Club”, the All Inclusive concept, which incorporates the ease of a pre-paid vacation with an endless array of facilities for guests to enjoy, at their own pace. A marvelous lagoon style swimming pool from where you can gaze onto the Mediterranean Sea. Nestled within the lush gardens is the children's pool and hidden away is a third pool enjoyed by adults and children alike. A few steps away lie 500 metres of natural sandy beach. 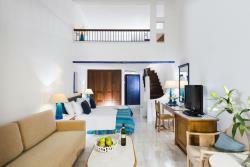 Rooms and suites at the Coral Beach Hotel & Resort have brought a new dimension to hotel design. Exclusively for guests appreciating real flair, rooms and suites are perfectly appointed and echoing centuries of culture within a hotel. 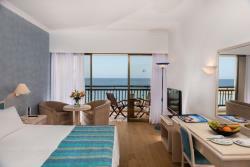 The elegant guest rooms have a private terrace or balcony and most are with sea view, guests may choose from suites with private swimming pools, dinning areas, whirlpools or gardens. 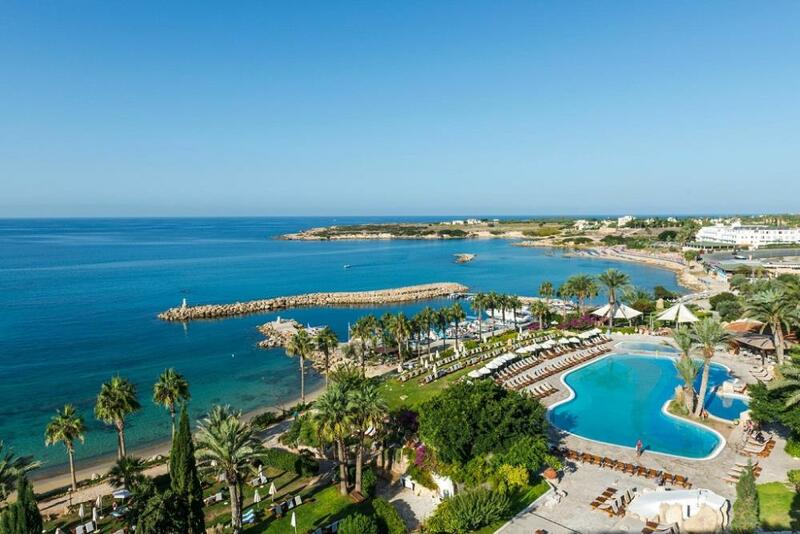 Taking advantage of the rich culinary traditions of Cyprus, the finest influences from Europe and the abundance of fresh seafood and produce availability, the resort hosts six restaurants with an extensive and diverse menu. From refined regional dishes, featuring fresh seafood, to cuisine of Italian and French flair. All skillfully and intrinsically linked to their surroundings. Bars and lounges are equally varied from the Odyssey Night Club to the Beach Bar, and from the Dionysos Lounge Bar to the Poseidon Pool Bar. Whether looking for a relaxing drink with friends or an exciting dancing night the Bars will offer you exaclty what you are looking for. The Coral Beach Hotel & Resort is proud to offer a new Olympic-size swimming pool which can be used by professional athletes and swimming teams. The hotel's Arts & Crafts Center is a unique feature for Cyprus and probably around the world. The Center, located right within the hotel, offers guests the opportunity to try traditional crafts such as basket-making, pottery-making, glass-painting, the art of mosaics and much more. This is the world of the Coral Beach Hotel & Resort, offering the most complete resort facilities on the island. And for those wishing for an active holiday the CoralBeach is a sports lover's paradise. When it comes to enjoying a cruise, do not go far: the hotel also has its own private harbour and boat and organizes a variety of day cruises during the summer season, weather permitting. The Coral Beach Hotel has a Children's club on site which welcomes guests of 4 years to 12 years of age. Younger children are welcome if accompanied by an adult. For sport lovers, there is a great variety of sports available. There are four floodlit tennis courts (two hard and two soft courts), a gym, an indoor swimming pool, a squash court, snooker, pool and games room. Coral Beach Hotel & Resort is located on the edge of the Akamas peninsula, only a short stroll away from the tavernas, bars, and shopping centre of Coral Bay Village. An idyllic setting with the turquoise sea glistening its invitation on the one side and the mountains on the other with blue sky all around. 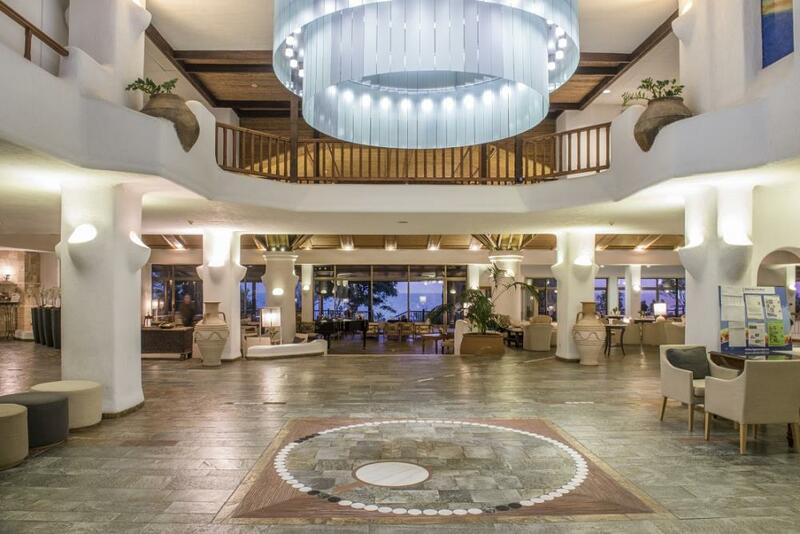 The Five Star Coral Beach Hotel & Resort pioneered the distinctive “Coral Gold Club” concept, which incorporates the ease of a pre-paid vacation with an endless array of facilities for guests to enjoy, at their own pace. Dinner: 19.00 -21.30, an enriched buffet is served, along with weekly Greek & Cypriot nights with live music & Folkloric floor shows. Choice of live cooking stations available in certain restaurants. Ice creams served at the Poseidon Pool Bar from 11:00 -18:00. Sweets, Snacks & Savouries are served daily from 10.30-12.30 and from 15.30-18.30pm and from 22.00 to midnight. Afternoon Tea and Coffee is served from 16.30-18.00hours including range of cookies and sweets. Please note that a variety of dining outlets are available for all inclusive guests. A specially prepared selection of Local & International Alcoholic & Non-alcoholic drinks. A selected variety of cocktails and hot drinks are on offer for your pleasure from 10.00am to midnight. Selected House wine, Local Beers, Soft drinks & draught mineral water are available with your meals. Each guest, adult and child will have their own Coral Gold Club ID. Please ensure that each member of your party has their Coral Gold Club ID with them when ordering food and drink. The Coral Gold Cub ID can only be used by the person it is initially assigned to and by no other. Please ensure you present your Coral Gold Club ID to your waiter when ordering your drinks and dining in our Restaurants. Alcoholic beverage will not be sold to guests less than 18 years of age. Parents or guardians may order alcoholic beverages for guests less than 18 years of age only if they are present during the order. The Coral Gold Club option can only be purchased when staying a minimum of three consecutive nights. 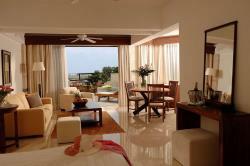 When choosing the Coral Gold Club option guests will have to remain on this option for the duration of their stay i.e. guests may not revert back to any other term of stay. Please note that whole family or party must be a part of the same option i.e. 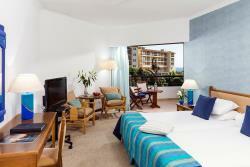 all adults and all children holidaying together must be a Coral Gold Club guest. Coral Gold Club guests are strictly forbidden from using their benefits to order food and drink for other non Coral Gold Club guests. The Coral Gold Club ID entitles guests to all benefits as agreed and highlighted during the time of booking and within this flyer only. Please note that dining outlets may be limited depending on season and weather conditions without prior notification. Complimentary bottle of sparkling wine and fruit for honeymooners and a romantic breakfast in room on arrival. Free use of sauna, steam room and gym. Esthisis is the Greek word for senses, meaning that at Esthisis all therapies and treatments aim to enhance your senses and feeling of well being. Allow the experts here to nurture your needs and enliven your soul with emphasis on individual attention. Esthisis is proudly associated with Phytomer and Elemis, two well established and quality products, when combined with the expertise of the spa team, ensure an experience of total relaxation and rejuvenation. Pamper yourself with rejuvenating spa treatments and be spoilt with life’s small pleasures. Choose from a wide selection of treatments and therapies to suit your personal need or preference. STARvAC is a dermotherapie® device reproducing the action of palpating and rolling massage for face and body. InFUSIOn™ Face & Body Treatments for needle-free Electro - Mesotherapy. Mixing business with pleasure at Coral Beach Hotel & Resort makes the absolute combination. Booking a company conference or incentive means being assured that every minute detail will be attended to by a team of highly-skilled professionals. A range of theme nights, opening and closing ceremonies and gala nights can all be a part of a flexible conference or incentive package. There is a choice of six restaurants in addition to the various function rooms all available for private dining or themed events. 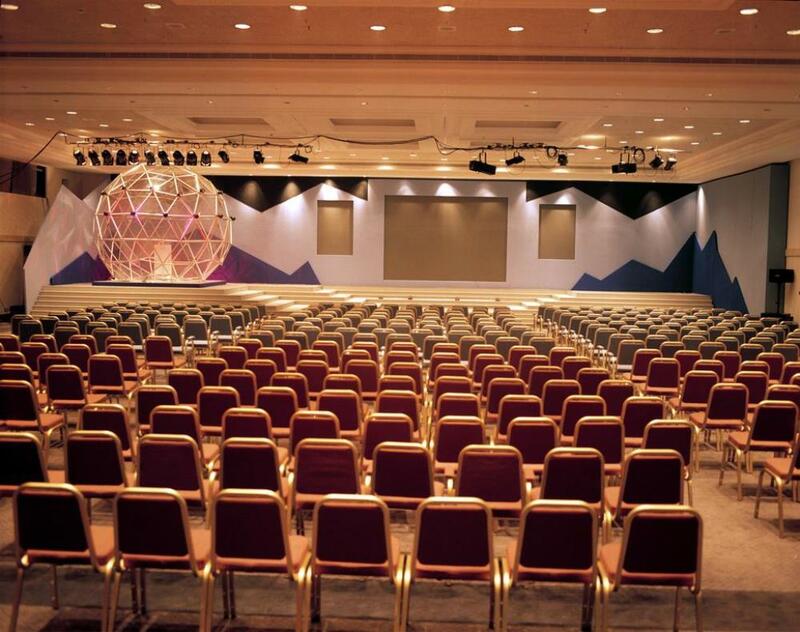 We can accommodate large or small conferences or incentives within 7,500sq. meters of meeting space incorporating over 20 flexible break-out or syndicate rooms with natural daylight. The Akamas is the pivotal hub of the Confernce Centre and is the largest and most flexible, colunm-free, multi-purpose room with a clear ceiling height of 5.4 meters. Most of the meeting rooms adjoin terraces overlooking the sea, ideal for coffee breaks, drinks receptions or you may wish to have your gala dinner there. Below is a list of all conference and syndicate rooms to assist you in organising your event. The Akamas International Conference Centre can accommodate large and small conferences or incentives within 7.500 square meters of meeting space incorporating over 20 flexible breakout or syndicate rooms with natural daylight. 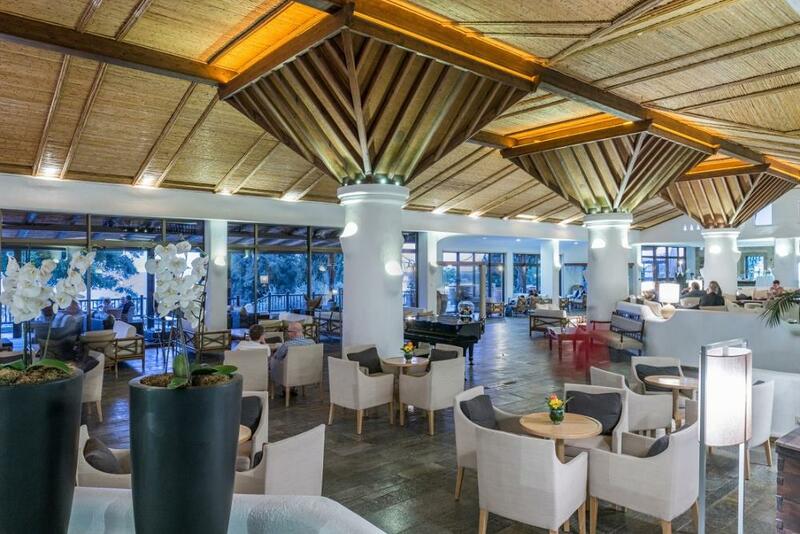 Akamas is the pivotal hub of the Conference Centre and is the largest and most flexible, column-free, multi-purpose room with a clear ceiling of over 5 meters. Akamas can be divided quickly into three soundproof rooms with independent air-conditioning, lighting and communications. 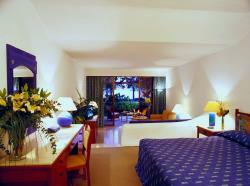 Each divided room has separate entrances from the extensive foyer and conference reception. Akamas also has a purpose-built stage and three simultaneous translation booths which can double as a technical gallery, state of the art audio visual and stage lighting. The Aphrodite is situated on the ground floor, close to the Akamas Suite and has views of the beach and pleasure harbour. 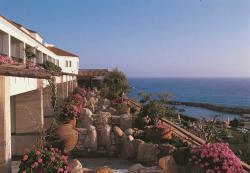 It is also adjoining an extensive terrace ideal for coffee breaks or drink receptions. Aphrodite can be divided equally into two soundproofed rooms. The Adonis on the ground floor is ideal for a press conference, seminar, syndicate room, boardroom or cocktail reception. 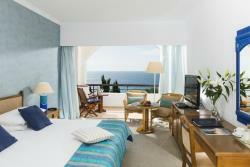 Ariadne is located on the Mezzanine level -which is one floor above the main meeting room Akamas. Ariadne is column free, enjoys views of the Mountains and is perfect for a boardroom meeting. The Akamas foyer may be partitioned to create Artemis. Artemis allows for a convenient and lockable storage area due to its close proximity to Akamas Conference Centre. Furthermore, organisers may choose to use Artemis as an internet area, where delegates may check etheir emails etc in between their conference times. The Mezzanine floor has five suites that can be utilised for both conferences and banqueting. Athena, Leda, Zeus, Hermes, Plato and two additional areas suitable for exhibitions and social functions, are further complemented by the Hermes Gallery. 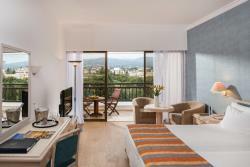 Avagas is located on the Mezzanine level -which is one floor above the main meeting room Akamas. Avagas is column free, enjoys views of the Mountains and is perfect for a boardroom meeting. This is a beautiful room with stunning views of the sea. Christian Barnard is perfect for a gala dinner or theme night or may be selected as your meeting room or exhibition centre. Christian Barnard adjoins a terrace which is perfect for coffee breaks or pre dinner drinks. Hermes Gallery is suitable for a coffee break, cocktail, exhibition space or organisers may wish to situated their hospitality desk here. 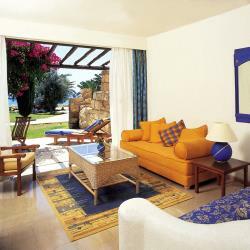 Situated on the Mezzanine floor Leda is a spacious, sound proof room, column free and enjoys beautiful views of the bay. 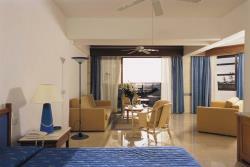 Plato is situated on the Mezzanine floor close to a further four breakout suites. This meeting room is sound proof, column free and offers natural day light. Plato is suitable for small groups or boardroom style meetings. Zeus is situated on the Mezzanine floor close to a further four breakout suites. This meeting room is sound proof, column free and offers natural day light. Zeus is suitable for small groups or boardroom style meetings. In addition to the syndicate rooms mentioned previously there are nine suites located on the Mezzanine floor, which can be converted to created further meeting room space should it be required.